Since the invention of the Evangelista Torricelli in 1643, antique barometers have been redesigned in a bid to improve its portability and accuracy. If portability was an issue, then its reduction to a mere stick may have just solved that. The antique stick barometer is a thin and just under one-meter long. 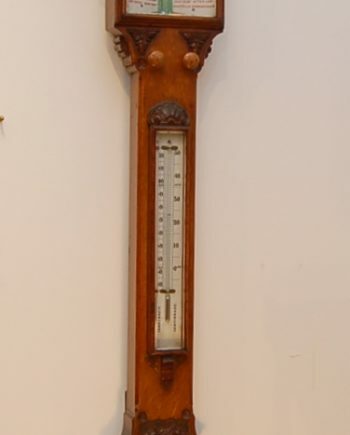 The stick barometer comes in two designs known as the Kew Pattern station and the Fortin barometers. The Fortin barometer is identifiable from an axial screw on the bottom – used to adjust the level of the mercury in its glass cistern at the bottom. Unlike its counterpart, the Kew Pattern type lacks the usual adjusting screw and the steel cistern makes it unnecessary to see the mercury’s lower surface. The Kew type is designed to hang on the wall from a knob or gimbal. There exists a second Kew pattern barometer called a bench barometer. The bench type is a free-standing type. In addition, the cistern at the base is much larger allowing a much wider pressure range. Instrument maker Benjamin Martin finely crafted the stick barometer as luxury objects for home use by wealthy individuals who have come to appreciate it. Antique stick barometers were also not spared from the furniture trend. Walnut, rosewood and mahogany woods are to be found in the furnishing of the casings. This type of barometer is known to suffer from inaccuracies especially when relocated to other regions. The only explanation being; the barometer has its wood curved in the moist England atmosphere and relocating it to a dry and hot region affects how it works. Although early examples had restoration done on them, physical alteration to an antique stick barometer to correct its reading is unnecessary. London makers of the stick barometer includes; F Darton & Company (Watford), Stampa & Company, Edward Troughton among others. Italians are also listed as among the makers of the stick type of barometer. An interesting observation is that stick barometer from the period 1660 to 1900 bear an engraved signature plus the street and premises’ address. There are over 3000 names recorded from the collections. This may be explained by some clients asking for a particular style or quality. We have gathered a wide collection of antique stick barometers for sale. We would be glad to source it for you in case we don’t have it at our premises. Perth, Australia is our current location, but we also have presence in Australia, USA, UK and Ireland.